Master with queen bed and bathroom. 2nd bedroom with two twin beds. This immaculate two bedroom, two bath home is nestled on a quiet wooded inside the 'Edgartown Triangle', just around the corner from Main Street and a short walk to downtown activities. You will appreciate the location and the convenience of having a supermarket, fresh seafood mart, bike rental shop, restaurants, Dairy Queen, and other amenities all around the corner. For those who like peace and quiet (as well as parents with young children), the house is set on a small gravel road -- there is virtually no automobile traffic. It's about equidistant to both Fuller Street and State Beaches, each approximately a mile to 1 1/2 miles away. Inside, you will find a home that has been meticulously upgraded and cared for with high end materials - central AC, hardwood/tile floors, 'real furniture' (not cottage retreads), high quality mattresses, Weber gas grill, Movie collection, wireless, hi-efficiency washer/dryer, and a wonderful gas fireplace. Additional availability info: Please check calendar, then confirm with owner. This is a Sunday to Sunday vacation rental. Long-Term Rental (1 month or more): Regarding winter stays, please contact owner. Perfect! This stay was our first in this house, but not our first on the Vineyard, having previously stayed in Oak Bluffs and West Tisbury. This house was by far the best yet and perfect for my husband, 2 young boys and I. As we finished up our 2015 vacation, we started compiling a list of requirements we wanted the next year (Central AC, bedrooms on the same floor, 2 baths, internet, walking distance to downtown...) and this house had them all. This house was extremely family friendly. The "family" room was large enough for the kids to play and the house had coloring books, crayons, puzzles and movies for the kids as well. There are two couches and a large chair, which provided ample space for all to relax after a day at the beach. The 2nd bedroom has 2 twin beds, of which we used one, but the room had plenty of room for our Pack n Play for our 2 year old. The yard is large and the neighborhood very quiet and minimal vehicular traffic to worry about with the kids. Some permanent resident neighborhood kids even came by one day to play with our boys. The house is in perfect location to walk downtown, which we did for the 4th of July Fireworks and dinners. The walk was approximately 12-15 minutes, walking at the speed of a 4.5 year old. The 4th of July parade is only a few minute walk away as well. And despite being on the island for a holiday week, we had no trouble getting into restaurants for dinner or even finding parking in downtown Edgartown and Oak Bluffs with our large vehicle. House is equipped with anything you could need and new(er) appliances. The gas grill was a good shape, the washer dryer are new, kitchen had everything we needed and there were more than enough bath towels and linens. The only thing that could make the house even better would be if there were beach chairs that renters could use. Joe (the owner) is super responsive and helpful. He promptly responded to all inquiries and emails. 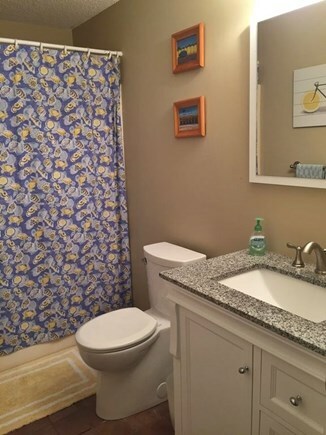 I only had one suggestion for him, which he said he would gladly do - to put a small step stool in the main bath for kids, as the counter height it a little high. Overall, this house was perfect for us and we will consider staying here again if it is just our family traveling as it was this year. In the past we have traveled with friends and required a house with 4+ bedrooms. My family just loves this house. And we have made wonderful memories in MV. We have stayed at the house for a week, past two years and heading back this year for another week. It is a very cozy place and you will feel at home right away. Every year before leaving my son looks at me says " Can we stay here longer?" and my response is " Son we will be back again!" A Perfect Place to Play! My wife, 14 month old daughter, and I stayed here for a week in early July 2014. This house was perfect for us. The bedrooms are nice and very adequate for what you'd want in a place that you are staying for a full week. The kitchen is nice with most everything that you'd need/want. 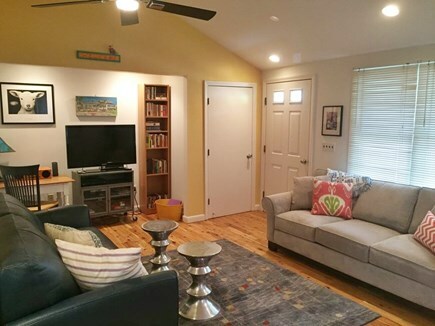 There is a nice big family room with high ceilings and 2 large couches and plenty of room for kids to play. There is also a flat screen TV and DVD player (and Joe has it stocked with lots and lots of DVD movies to choose from!). 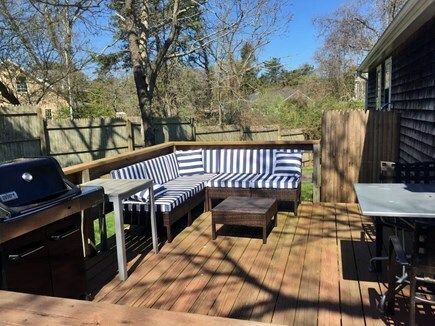 The back deck is great and the outdoor grill was very nice to have. We used it 3-4 times. The best thing about this house (for us, at least) was the location. It is a 5 minute walk to the grocery store, which is extremely helpful. 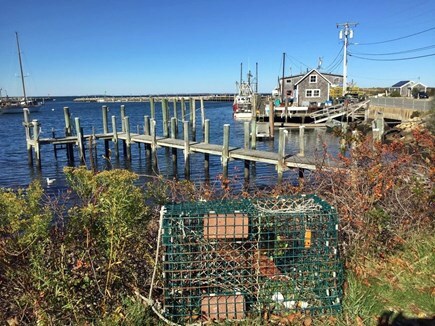 Downtown Edgartown is about a 10 minute walk. There is also a school nearby with lots of open fields and plenty of jungle gyms and swings for kids. If you don't plan on having a car during your stay, this is a great house because you can walk to so many things. We did have a car and only really used it to go out to South Beach and to travel to other parts of the island to explore. Joe, the owner, is very responsive to any questions or concerns. We had only one small issue with the outdoor shower not being turned on, and Joe responded to our email immediately and had the issue resolved in a matter of hours. We loved this house and plan to come back. It was perfect for our family of 4 with 2 little guys under age of 4. The house is clean and well organized. Joe does a great job keeping it well stocked with everything you may need for cooking and relaxing. Kitchen even has a full rack of spices for cooking (I was very impressed!) Living room has a great collection of DVDs (our little guys loved to finish the day on a couch watching a new movie). The location is great as well - walking distance to a couple of grocery stores and a couple of take-out joints. Nice stride to downtown Edgartown for an ice cream or coffee. We had to drive to the beach though, but with all the equipment for kids we would have to drive in any case. Joe was particularly awesome when we realized that we left a couple items behind. He helped us to retrieve them and we are so grateful for that. Thank you, Joe! We hope to be back again next summer. Great Stay, 2nd Yr in a Row! My family and I stayed at this home for the second year in a row and had a wonderful time. We have stayed at a number of places on the Vineyard over the years and this is the only place we've stayed twice! Joe is very responsive and does a great job of making it feel like a home--you can really tell he puts TLC into the place. First, Joe, the owner, is great to work with. There was nothing difficult about renting this property - it was a great experience all-around. My wife and I got married on the Vineyard three years ago and had not been back since...we really needed a vacation- and this was perfect. The house was remarkably clean when we arrived. It is off the beaten path - which is a good thing- because it was so quiet. It felt like staying at a place up-island because it was so quiet but having the convenience of Edgartown around the corner. 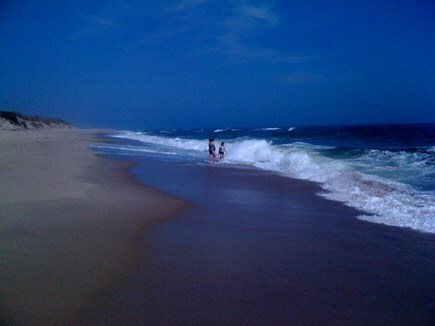 It is a 15 minute walk to the heart of downtown Edgartown- right past all the major landmarks you'll want to visit. The grocery store, package store, bike rentals, car rentals and restaurants are less than a five minute walk-- major roads to other areas of the island are easily accessible- the location is convenience to say the least. The house itself is cute and has everything a small family or couple would need to be comfortable on vacation. We spent a lot of time on the back deck - where ate lunch and breakfast every day. Again, the house was clean and provides the modern technology amenities we have grown to expect (strong wireless internet, HD TV, washer & dryer).